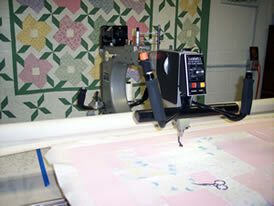 Our quilting services are divided into three levels and vary depending on how much quilting you desire. Each level is based on a dollar amount per square inch. To calculate square inches, multiply the length of the quilt top by the width.. The result is the square inches of your quilt top. Multiply the square yardage by the estimated charge for the services listed below. There is a Minimum Charge of $40 that applies primarily to smaller quilts. The prices exclude additional charges for piecing, batting, backing, rush orders, hand binding, shipping, and insurance. 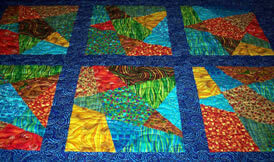 Please use the Quilting Order Form provided when sending us a quilt. A 50% deposit of the estimated services is required for each quilt and the balance is due upon completion and prior to return shipping. This service also applies a pantograph pattern or edge to edge quilting over the entire surface of your quilt. You can choose from one of our 100's of patterns to compliment your quilt.. This service allows you to select a pantograph pattern for the interior of your quilt and a different pattern for your border. This service allows you to choose any combination of inserts or patterns to enhance your quilt piecing or applique. Including borders, simple designs in the open areas and echoing, meandering or stippling. We can offer you our binding service if you provide the material. We can make and attach the binding for you by machine for .10 per linear inch. Or we can make the binding, attach by machine and hand bind for an additional .20 per linear inch. Piecing Back Material and Repairing seams or borders. We can provide muslin or white backing material. Colored backing materials (some in 108" widths) are available upon request. 80/20 Hobbs and Polyester Battings are available. Warm and Natural available upon request. We have thread in various colors to enhance your quilt. Please call ahead and schedule an appointment if you plan to deliver your quilt top in person. Copyright Â© 2004 A Quilting Hand.com All rights reserved.